I love pretty much all fruit, but if I had to pick my absolute favorite fruit, there’s no question what it is — fresh, in-season peaches. Sweet and juicy and summery and delicious. The local fresh peaches have been absolutely amazing recently, so I’ve been buying tons of them, and using them in as many different recipes as I can. Until now, my favorite peach recipes were this peach lemonade, these peach oat crumble bars, and these boozy amaretto peach popsicles. But step aside, old recipes, because I have a new favorite — this scrumptious Baked Peach Oatmeal. I typically think of oatmeal (baked or otherwise) as being a cooler-weather food, but with sweet, summery peaches added to it, it has a lightness and freshness that makes it totally perfect for this time of year. And baked oatmeal is a year-round favorite of mine because of how wonderfully re-heatable it is. While it’s fantastic straight out of the oven, I love the leftovers so much for quick weekday breakfasts (or snacks). Just cut a single-serving portion, pop it in a microwave-safe bowl, add a splash of milk for creaminess, and heat for 20-30 seconds. Bam! A hearty, delicious, quick breakfast to start the day off right. And I’ve found that baked oatmeal is also fantastic if you have little ones to feed – it’s easily crumbled into baby/toddler-grabbable bites, and is always a huge hit with my daughter and her playgroup friends. So, if you’re looking for another awesome recipe to highlight summer’s beautiful peaches, you must give this one a try – I know you’re going to love it! Preheat the oven to 350 degrees F. Grease an 8×8 square baking dish and set aside. In a medium bowl, mix together the dry ingredients: the oats, brown sugar, salt, baking powder, and cinnamon. In another medium bowl, whisk together the wet ingredients: the milk, egg, maple syrup, and vanilla extract. Note: If you are planning to bake this now, proceed to the next step. If you are preparing this the night before to bake the next morning, simply store the mixed dry ingredients in an air-tight container at room temperature, and store the mixed wet ingredients in an airtight container in the fridge. Proceed to the next step when ready to bake. Toss the chopped peaches with the dry ingredients, and transfer evenly to the prepared baking dish. Pour the wet ingredients over the oat/peach mixture, and shake the baking dish gently to make sure the milk coats everything evenly. If desired, add a few sliced peaches to the top for garnish. Bake at 350 degrees F for 40 minutes, until the top is golden brown and oatmeal is set. Let cool for 5 minutes and serve warm. Note: This baked oatmeal is excellent reheated in the microwave. I simply cut a single-serving portion, put it in a microwave-safe bowl, and microwave for about 20-30 seconds, until hot. I pour of splash of milk over for extra creaminess, and serve immediately. this sounds wonderful! i love baked oatmeal but haven’t ever tried it with peaches before. yum! I’m buying SO many peaches this summer too! The season is so short, and I just can’t get enough of them. Your oatmeal looks like a perfect way to bring peaches to my breakfast table! This sounds so good. Our local peaches are just about ready and I cannot wait. They are one of my favorite fruits. I love anything with peaches and cannot get enough of them! This sounds so good and looks like the perfect mid-afternoon snack! Yum! Ive done apple and banana baked oatmeal but I bet peach would be delicious right now. This might be the perfect back to school breakfast for the kids next week. 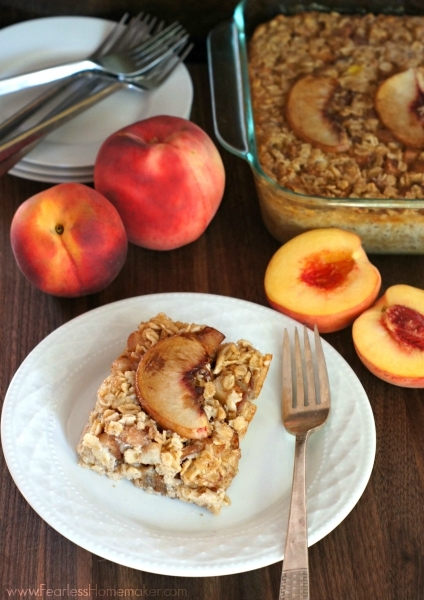 I love peaches and they sound absolutely perfect in this baked oatmeal! Great idea! Oh yes, I could have some of this oatmeal as a dessert and then again for breakfast. OH YUM! This sounds so deeeelicious! Oatmeal and peach sounds like a deadly combo! This looks so good! 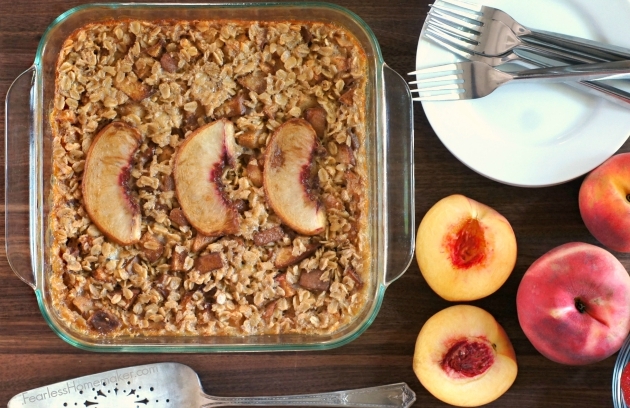 I love the idea of making a summer fruit baked oatmeal (and peaches are a favorite of mine). As you know, we love your Pumpkin Pie baked oatmeal, so I decided to give this one a whirl & it was delicious. Toddler has been enjoying it for breakfast (as have I). Love that this uses summer fruit & was delicious made with almond milk. Thanks for sharing the recipe! I’m so thrilled you and kiddo like it! We’ve been eating it almost daily here, too — sometimes as a breakfast for all of us, sometimes as a mid-afternoon snack for me while the little one naps. Love the summery peaches instead of the fall pumpkin! I have some homegrown peaches that I wasn’t sure how to use.. I think I will try this Looks healthy! That looks WONDERFUL! We love baked oatmeal – the addition of fresh, summery fruit is genius! Baked oatmeal is my favorite in the mornings. I love this version with peaches.